This year’s Nail Those Profits cruise is off to a great start! Look for some upcoming blogs that will give a little more detail and information on the classes, as well as one letting you know where the cruise is heading next year! I got some hints and have to tell you I can hardly wait to share! You didn’t need to bring much with you in order to participate. The Profiles girls offered an amazing pre-cruise option to purchase sample sizes of products you could use. This was a great way to be able to do liquid-and-powder hands on without lugging a bunch of things from the salon. 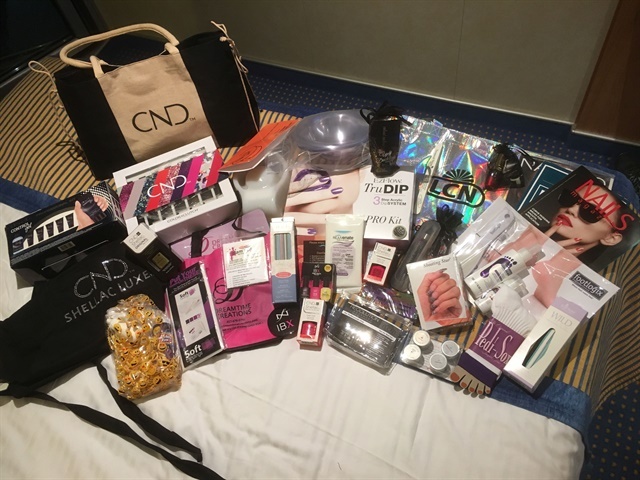 Then Gina Sylvestro of Akzentz supplied some gel samples for nail day and Kellie the Crystal Ninja hooked everyone up with some Swarovski and a Crystal Katana so you could practice application as well as use them for the cruise competition at the end of the week. I’m sharing a photo of part of the goodie bag haul. It was definitely a generous gift from all the companies that made it easy to do some hands-on while cruising without having to pack so heavy. We will most certainly need extra space in the luggage to get it all home though!